Recently we headed off to Fuerteventura for a week of doing literally nothing. We’d handpicked a trip that meant minimal travel to and from the airport at both ends – which was seriously appreciated – but we also decided to challenge ourselves by sharing one case, a small case, not the ones you’d usually stuff 23kg into - although we did actually manage to squeeze 20kg into a small one! Here's how I sorted my essential travel beauty bits, i.e. products that I knew I would use every single day of the trip. 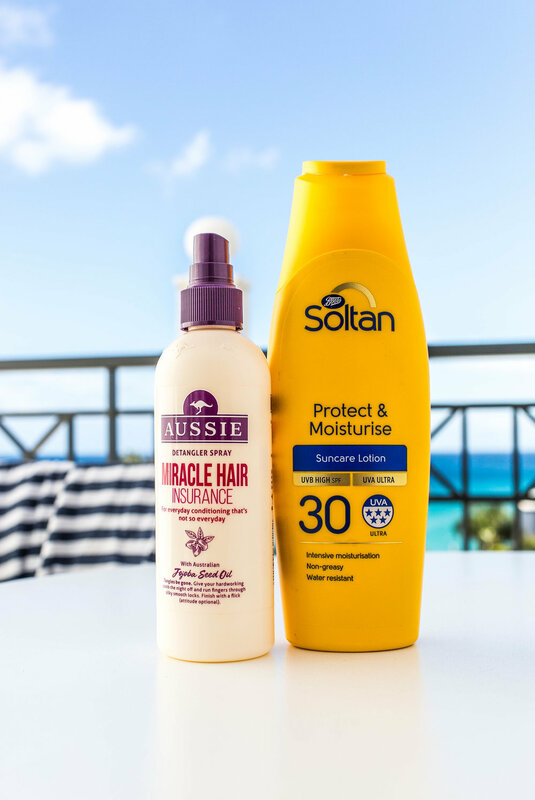 Before we flew out I asked one of my besties what kind of detangling spray she used, and she reminded me of how we both used to rely on Aussie Miracle sprays a lot back in the day. I instantly headed to Superdrug and bought myself a bottle. As soon as I sprayed it on, memories of being a young girl struggling with her curls came flooding back. There’s definitely a reason that this product has staying power. Thanks to nourishing Jojoba Seed Oil, this is a spray that you can literally spray every single day, without experiencing any build-up. I waited five days before washing my hair on the holiday, as I actually love what sea water does to my curls, but during those five days this spray kept my hair fragrant, tangle-free and soft. Usually when I’m shopping for SPF I’ll wait until it’s on offer during the holiday season, so I can buy in bulk, and you’ll often find Soltan doing some kind of offer or freebie if you hang on. What I love about this product is that it really does moisturise. It takes a bit of rubbing in, and if you have dark skin you definitely need to rub it in a bit more so you aren’t left with a purplish tint. 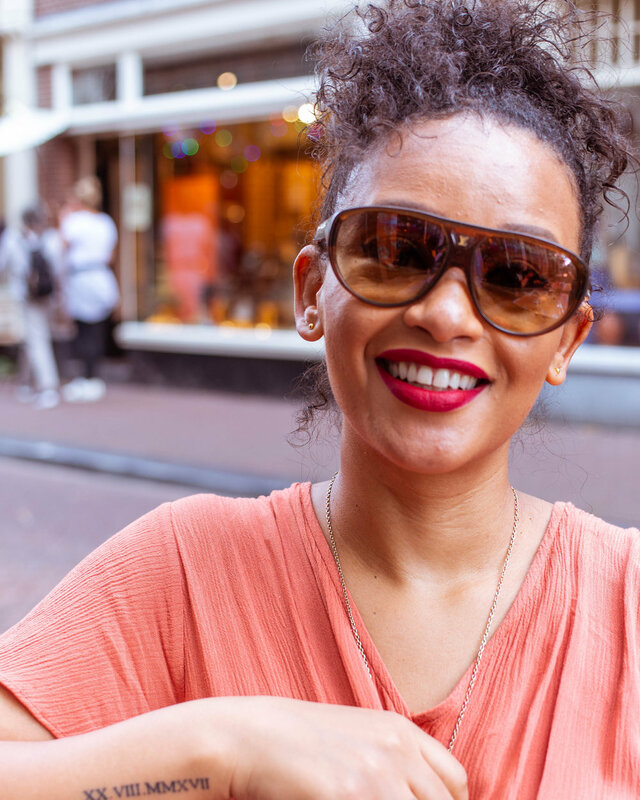 (I hope you’re not sitting there thinking you don’t need SPF because you have dark skin – skin cancer does not see colour!) It’s non-greasy and goes on fine over your body moisturiser. A must-buy. Let me count the ways I love thee Mario Badescu… I bought this product after a conversation with makeup artist Yacine Diallo (if you haven’t read this skincare blog yet, go read it now! ), and it hasn’t left my side since. It’s the perfect product to apply post-cleanse before your serum and moisturiser. It’s great for that first hit of moisture after applying a detoxifying mask and is light enough to keep makeup refreshed throughout the day. This has been an amazing addition to my revamped skincare routine, and adding it to my travel beauty essentials, I believe, is what kept my skin calm when it came to acclimatising to the heat. I’m running low on perfume right now, which is probably a good thing, as I would usually take at least two options with me on holiday. Either way, this fragrance would have been coming with me; it’s gorgeously light and intense at the same time, thanks to the bottom notes of chocolate, vetiver and vanilla musk. The brand claims that it captures the ‘raw energy of desire’, and they might be right, given my hubby’s response every time I wear it. It’s a great anytime fragrance for those who aren’t into light, fresh, fruity scents. I’m already wishing I’d bought several tubes of this stuff – not because it’s running out, but because I never want to run out! I can honestly say this tinted moisturiser has changed my approach to makeup during the warmer months, but also when I need to take care of my skin and still want some sort of coverage. This goes on like butter, has a super light fragrance that feels refreshing, and is perfect for mixing into your foundation if you want a touch more coverage. I bought mine in the shade Cuba, a medium shade with pink and yellow undertones, which is perfect. I love the approach to colour with this product, as so many tinted moisturisers are one-size-fits-all and usually come in just 4-5 shades, but there is of course always room for improvement. The range consists of 12 shades and is crying out for some more options at the darker end of the spectrum. While I skipped blush and mascara for much of the holiday, I’m a red lip girl at heart and always find that it makes you look polished, especially if you’re trying to get some shots for your blog done. Although my all-time favourite matte lip product is still Lime Crime’s Velvetines, Huda’s definitely come through with the colour options and finish on this product. It never feels drying, ever, and stays on through most drinks and food, unless you're eating something greasy. You can top up once, but I wouldn’t recommend constant re-applying as it tends to build up and crack a little. We tend to sweat more on our hols, and that, plus random dips in the salty sea water, means even the best liquid matte lip won't last as long. For staying power I apply mine on top of MAC Cosmetics’ Cherry Lip Pencil, £14. Any packing hacks you’d like to share? Let me know!